The number of Russian tourists in the first five months of this year exceeded the 1 million with an increase of 46 percent compared to the previous year. This is a new record, according to the Turkish Travel Agencies Association (TÜRSAB). While tourism professionals say they are ready to leave their difficult days behind, the most important actors in this development seem to be the Russian tourists. As the crisis caused by the downing of the Russian jet on November 24, 2015 has almost been forgotten, the reconciliation between the two countries has increased in many areas. The tourism sector has been reaping the fruits of this rapprochement as well. Envisioning 2018 as a new record year, sector representatives are expecting six million Russians to come to Turkey this year. According to reports, the influx of tourists to Turkey have also brought a major increase in scheduled flights. Following the unexpected increases last year, many tour operators had trouble in supplying airplanes. However, this time the tour operators turned to scheduled flights, with agreements made earlier, in addition to charter flights. Atlasglobal, a private Turkish carrier, shifted its flight routes to Russia with a guaranteed flight view, while another Turkish airliner Pegasus got permission for three new direct flights from Russia to Dalaman, according to a report in Turkish daily Dünya yesterday. According to the Ministry of Culture and Tourism data, the number of Russian tourists visiting Turkey in 2017 stood at 4.7 million. The positive course in the Russian market continues in 2018 as well. In the first four months of 2018, the number of visitors from Russia rose by 63.9 percent to 524,000 in comparison to the same period of 2015, regarded as the record year for the Russian market, according to the April border entry statistics. The number of visitors from Russia to Istanbul increased by 72 percent to 196,474 people. Leading the way in the number of tourists as the locomotive of Turkish tourism, Antalya tops the provinces most preferred by Russian tourists. According to the Turkish Travel Agencies Association (TÜRSAB) data, the number of tourists coming from Russia in the first five months of the year exceeded the one million threshold with an increase of 46 percent compared to the previous year, breaking a new record in this regard. 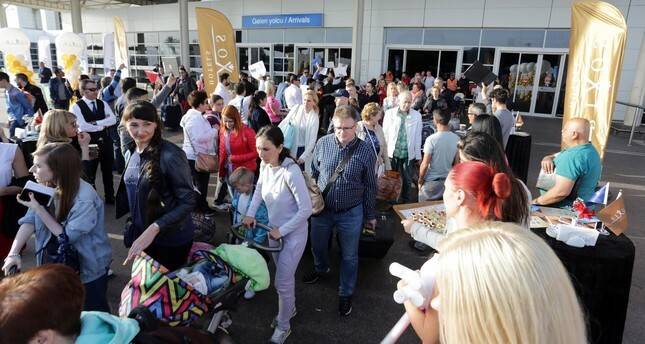 740,000 Russian tourists visited Antalya in May alone. Corendon Tourism Group Chairman Yıldıray Karaer predicted that this year they will have a tourism season similar to that of 2015, the most successful season of previous years, arguing that the tour operators always want to sell Turkey packages. "Because Turkey is in an important position in terms of price-quality balance," he added. Karaer said in July last year the demand for Turkey boomed and that the airline companies were unprepared for that situation. "Tour operators had a hard time finding planes to fly to Turkey. However, both tour operators and airline companies have taken measures for 2018." He also noted that they got early signs of an increase in demand with Corendon Airlines in their group and that they increased the number of direct flights from Europe to Antalya by 50 percent, raising the number of flight destinations from one to four by the end of last year. Meanwhile, OTI Holding Regional Director Koray Çavdır stated that demand and supply overlapped that year because sales were realized above expectations compared to the findings of the previous year. "This year there does not seem to be any problem in the airplane planning of the main operators in the market, including ours. During the summer period, a number of Turkish carriers arrange scheduled flights from Russia. We can list them as Turkish Airlines (THY), Onur Air, Pegasus, Atlasglobal, SunExpress and Corendon," Çavdır said. He stressed that this year, Turkey's share in the total international departures for tourism from Russia is close to 50 percent. Atlasglobal Assistant General Manager Nevzat Arşan noted that this year Turkey expects 36 million foreign tourists and that a very significant part of these tourists will come from Russia, Commonwealth of Independent States (CIS), Iran and Germany. "In this context, as a priority, in order to contribute to Turkey's tourism objectives, we are increasing the number of flights to Antalya and Dalaman regions," he continued, adding that they are also increasing the number of cities in CIS countries from 15 to 20 and the number of weekly flights from 80 to 240. Also, Pegasus Airlines CEO Mehmet Nane remarked that this year there is an increase in the number of Russian tourists just like the previous year. "These increases are reflected in the scheduled flights at the same rate. We also observe an intense increase. We think this increase will continue," Nane noted. TÜRSAB Chairman Firuz Bağlıkaya said together with the re-establishment of relations between Turkey and Russia, there was a serious rise in demand from the Russian tourists for Turkey in 2017, underlining that a total of about six million Russian guests are expected to be accommodated this year.